We are approximately 30 kilometres north of Sydney in the Shire of Hornsby and very close to Castle Hill, Hornsby and Dural. With easy access from the West – we can cover all of the Hills District to as far as Windsor. Guests from the centre and South of Sydney can quickly reach us by the M2 – or via the Old Northern Road from Pennant Hills. We can be reached in under an hour from Sydney CBD. Via Hornsby – If you go through Hornsby, take the road to Galston Gorge, turn right at the roundabout in Galston and follow Arcadia Road (which soon becomes Bay Road) towards Berowra Waters. Look for the Calabash Road approximately 1km past the Arcadia Fire Station on the left. Turn into Calabash Road and follow it for about 500yds where it branches steeply to the right. We are No 27, right on this bend on the left hand side. Turn left at Castle Hill Road if you are coming from the Cumberland Hwy (7) northwards. Turn right at the second set of lights into New Line Road. Now just follow New Line Road all the way to the Galston turnoff in approx 15 mins. > From Galston – see below. Via Pennant Hills Road from Beecroft – Turn right from Beecroft Road onto the Pennant Hills Rd and get directly into the left lane. 100 metres futher on, turn left into Boundry Road. Follow Boundry Rd until it hits New Line Road at the fourth roundabout and turn right towards Cherrybrook. Now just follow New Line Road all the way to the Galston turnoff in approx 10 mins. Follow Galston Road and turn right at the first roundabout in Galston and then left at the second roundabout into Arcadia Road (approx 200 yds futher on). Now follow Arcadia Road (which soon becomes Bay Road) towards Berowra Waters. Look for the Calabash Road approximately 1km past the Arcadia Fire Station on the left. Turn into Calabash Road and follow it for about 500yds where it branches steeply to the right. We are No 27, right on this bend on the left hand side. 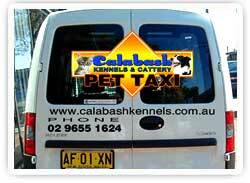 Pet Taxi Service – Quality Transport for your Pet. We can supply pet carriers on request and are able to taxi your pets to and from Calabash Kennels & Cattery, accompanying them at all times ensuring our continuation of care. 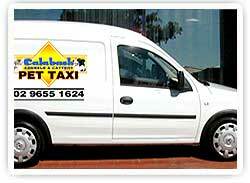 We can now offer our own Pet Taxi Service. Our Hyundai i-Load van with airconditioning has been purchased specifically to transport “your other children” to and from Calabash Kennels & Cattery. Please call Linda or email for a quote. Both arrived home happy and well. A big thank you for taking special care of Sevee. She does not cope well with new things in her life at the moment, so a great opportunity to get her used to staying with you there as part of her normal life. I hope next time she is less anxious for the first 24 hours. She is really starting to become part of our family and her lovely, sweet personality is peeping through the mask! We are very excited to see more!!! Dear LindaThanks so much for your email. Sorry to have taken so long to get back to you and to let you know about their arrival in Canada. Anyway Linda, I am just so grateful to you for looking after them so well. Only sorry we took so long to find you. 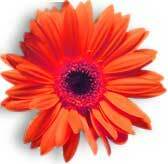 Thank you and I know that your business will continue to bloom!